They crawled back from an 11-point deficit and were in position to steal a huge upset victory. Down by one point with 1.9 seconds remaining, the Liberty Lady Flames basketball team took a timeout to set up an inbounds play from beneath their own basket. After a few seconds of scrambling as the Lady Flames attempted to get open, sophomore guard Ria Gulley tried to force the ball inside to sophomore forward Bridgette Rettstatt for a game-winning layup. But the ball was not caught cleanly, and the buzzer sounded as Rettstatt and others scrambled on the hardwood floor. 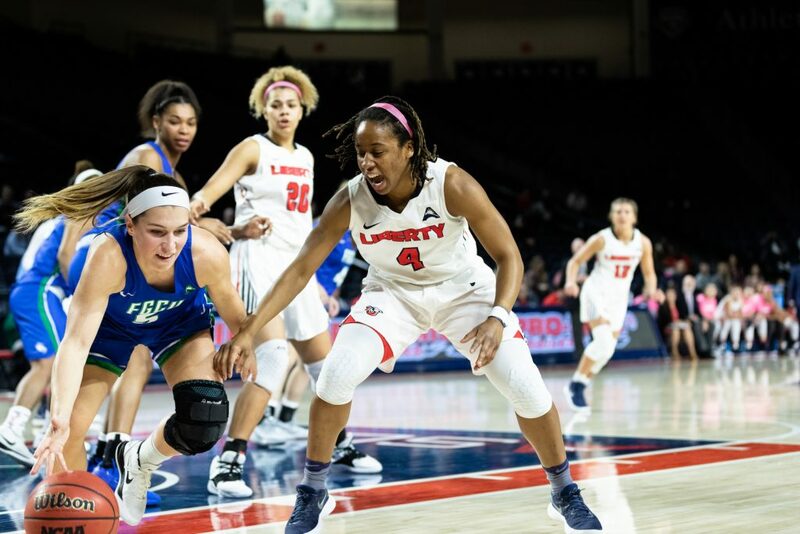 The Florida Gulf Coast University Eagles survived their program’s trip to the Vines Center, eking out a 65-64 win Saturday, Feb. 9. The Eagles kept intact a conference-best winning streak of 10 games and improved to 19-4 overall, including a perfect 10-0 in the ASUN Conference. The Lady Flames, who fell to 9-14 overall and 5-5 in ASUN, rallied from a 56-45 deficit late in the third quarter. They briefly took the lead on a Rettstatt turnaround jumper in the paint with 43 seconds remaining. CHARGE — The Lady Flames are currently ranked fourth in the ASUN. The Lady Flames started strong, especially on the defensive end, taking a 19-12 advantage early in the second quarter after a basket by senior guard Melis Ucar. But the Eagles soon found their footing. 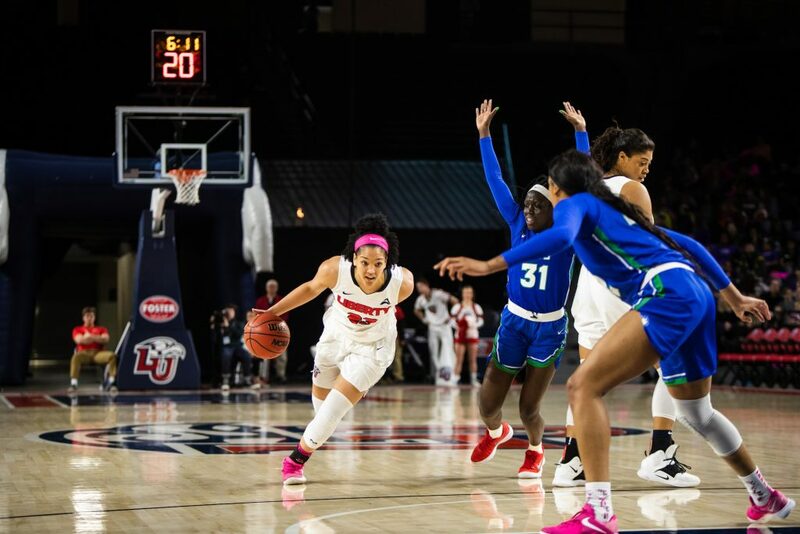 A three-pointer by guard Kerstie Phills put Florida Gulf Coast up 22-21 with 4:20 left in the first half and the Lady Flames went into halftime down, 29-26. Florida Gulf Coast continued an extended run in the second half, pushing their lead to a game-high 11 points with 1:44 remaining in the third quarter. The Lady Flames responded with a 14-4 run, punctuated by a beautiful pass from Rettstatt to forward KK Barbour for a layup, to climb to within a point at 60-59. Turnovers were a major issue for Liberty, who coughed up the ball 24 times, compared to nine turnovers for the Eagles. Green said that ball security was “no doubt” the biggest difference maker in determining the outcome of the contest. Florida Gulf Coast scored 29 points off Liberty turnovers. FIGHT — Senior guard Tatyana Crowder fights to keep the Eagles from reaching the basket. After sitting out the past six games, point guard Ashtyn Baker came off the bench and contributed three assists and three rebounds in almost 12 minutes of action versus Florida Gulf Coast. Baker averaged 7.5 points in the Lady Flames first 16 games of the season. Green would not commit to whether he would start Baker in Liberty’s next contest, which is against Lipscomb University (3-20, 1-9 ASUN) at 7 p.m. Tuesday, Feb. 12, at the Vines Center.